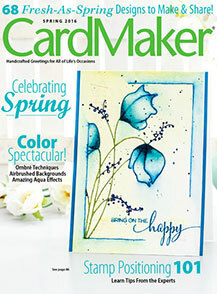 Spring 2016 CardMaker Magazine Publication! My posts have been sparse in the last few months because I have been trying to work out balancing my new role as a mother with all of my normal activities but I have vowed to get back to my normal crafting self this year. I look forward to sharing new posts and crafty inspiration with you! Hello again everyone! 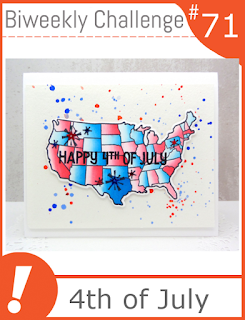 I'm back today with a quick post and a happy Fourth of July card. I colored The Greeting Farm's Cheeky Mate stamp with patriotic colors to represent the Fourth of July holiday. I actually colored this while nursing my three month old son since he hasn't been giving me much craft time in the last couple of days. I think I could have done a better job with my coloring but considering the circumstances I guess it's not bad. What do you think? I used Copic Markers to color the Greeting Farm image. Then I cut a few die cuts from blue foil cardstock to give the card a little shine. I decided it didn't quite have enough shine to represent the 4th so I also added a few sequins. 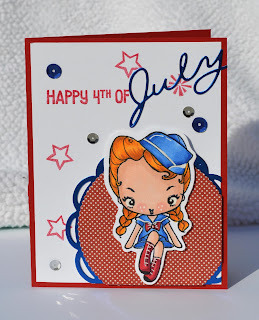 I'm submitting this card to the Marker Pop 4th of July challenge and the Simon Says Stamp Wednesday Anything Goes Challenge. Please check out the other entries here and here. Welcome everyone! 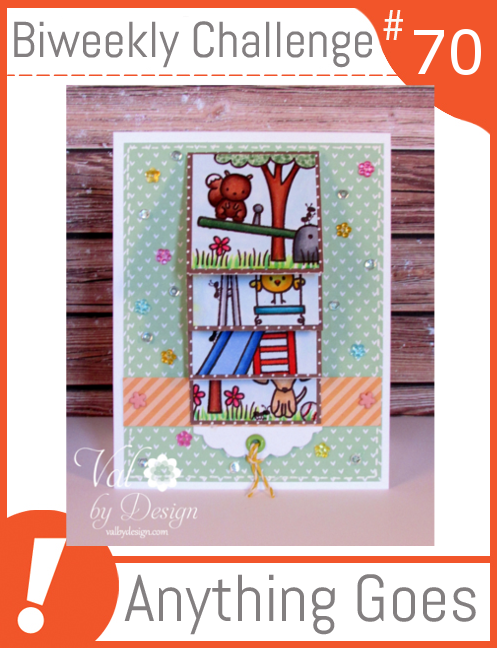 I'm back again today with another Lawn Fawn card. 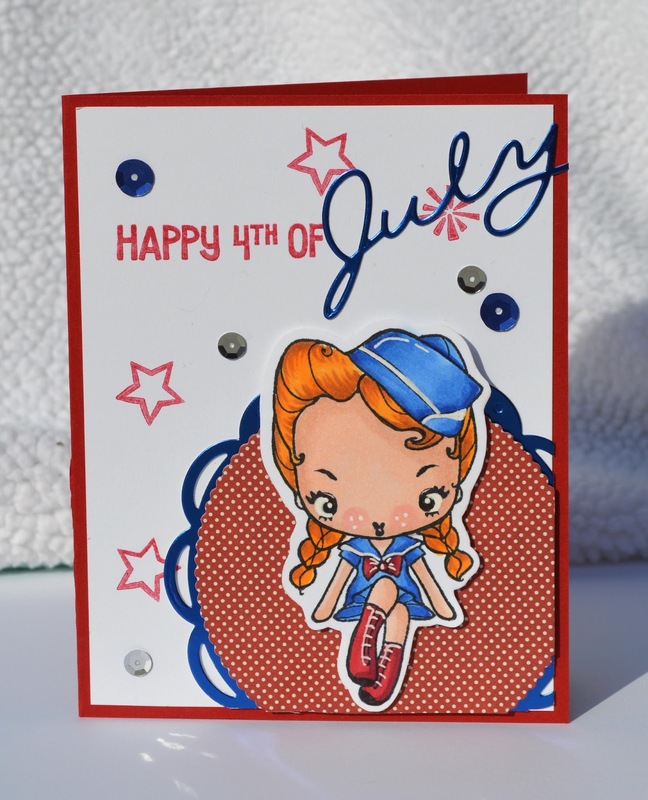 I promise I do own many other brands of stamps but I have recently been on a Lawn Fawn card kick because their new releases are so awesome. Today I am using their new stamp set called Happy Wedding. 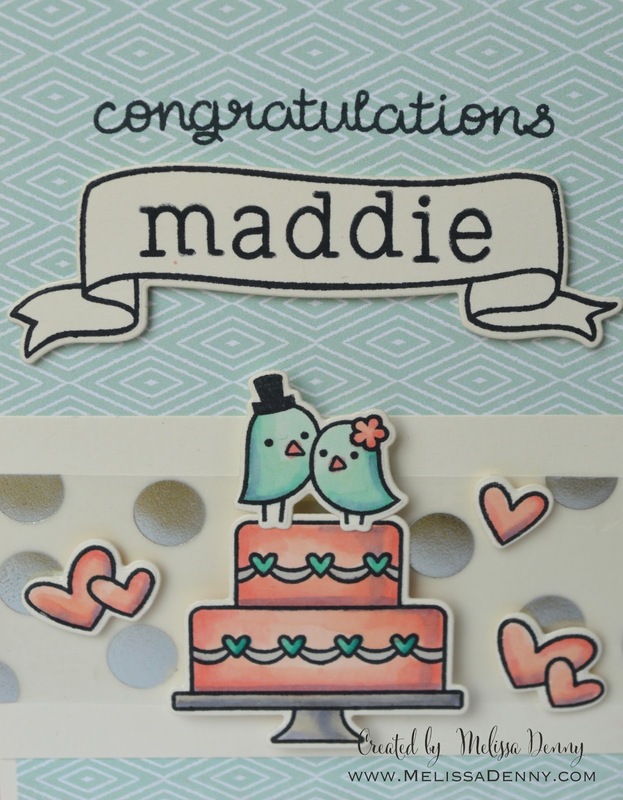 This stamp set is super cute and I knew it would be perfect to make a bridal shower card with for the shower I will be attending next month. 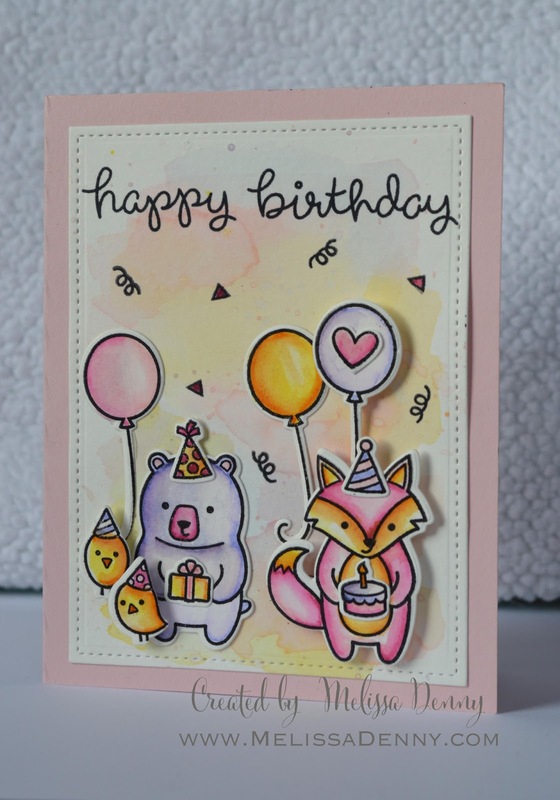 I left this card pretty simple because I wanted the cute images to be the focus of the card. I colored my images with copic markers and I layered them on top of a piece of My Minds Eye vellum that has a silver foil dot design. I hope that Maddie likes it. What do you think? 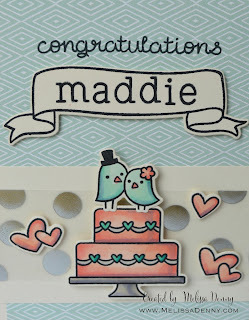 Does it make a nice bridal shower card? Thanks so much for stopping by! I really appreciate all of your comments and follows. Hello everyone! 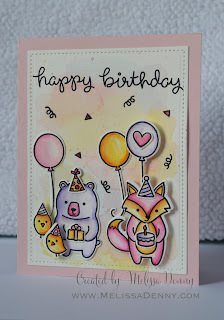 I'm back again today with another watercolor card for the Pretty Pink Posh Watercolor Blog Hop. 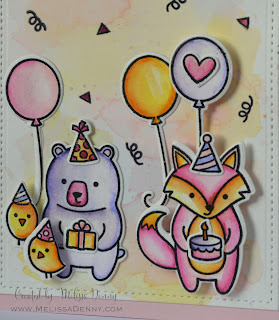 I used one of the new stamp sets from Lawn Fawn called Party Animal. 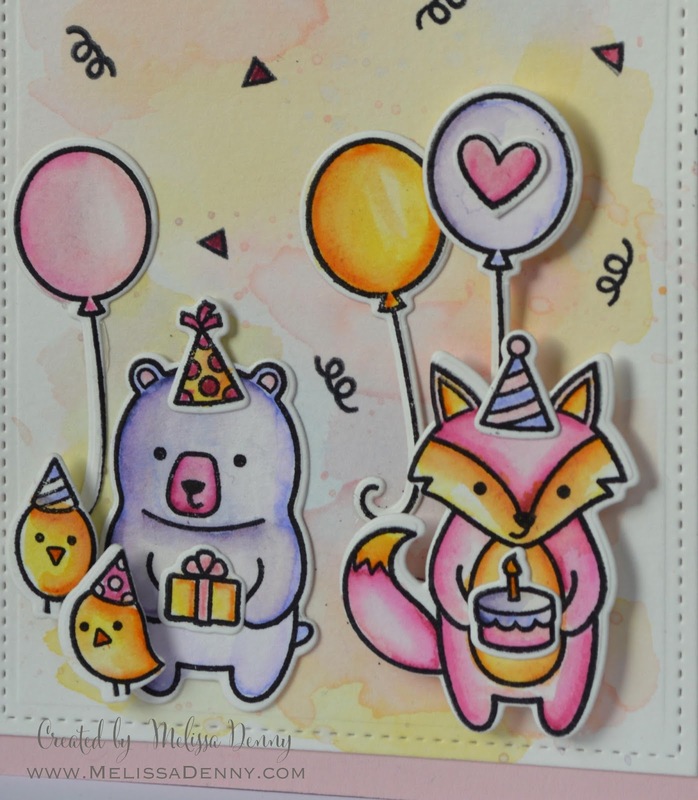 I just love all the little details in this stamp set and I had so much fun using my distress inks as watercolors! To make my watercolor background I used Canson watercolor paper and Distress Inks in Squeezed Lemonade, Spun Sugar, and Shaded Lilac. I put the ink on my Ranger craft mat and added a little water. Then I wet the watercolor paper down with a paintbrush and added the ink. Adding more water lightens the ink color to give the outcome I achieved. I stamped my images from the Lawn Fawn Party Animal stamp set on the watercolor paper using StazOn ink. I used Distress Markers in Spun Sugar, Spiced Marmalade, Picked Raspberry, Squeezed Lemonade, Dusty Concord, and Shaded Lilac to color my images in. On most of the images I just put a little ink on the inner stamp line and used a small paintbrush with water to draw the color in to the rest of the image. Them I cut out the shapes with the Lawn Fawn Party Animal dies. 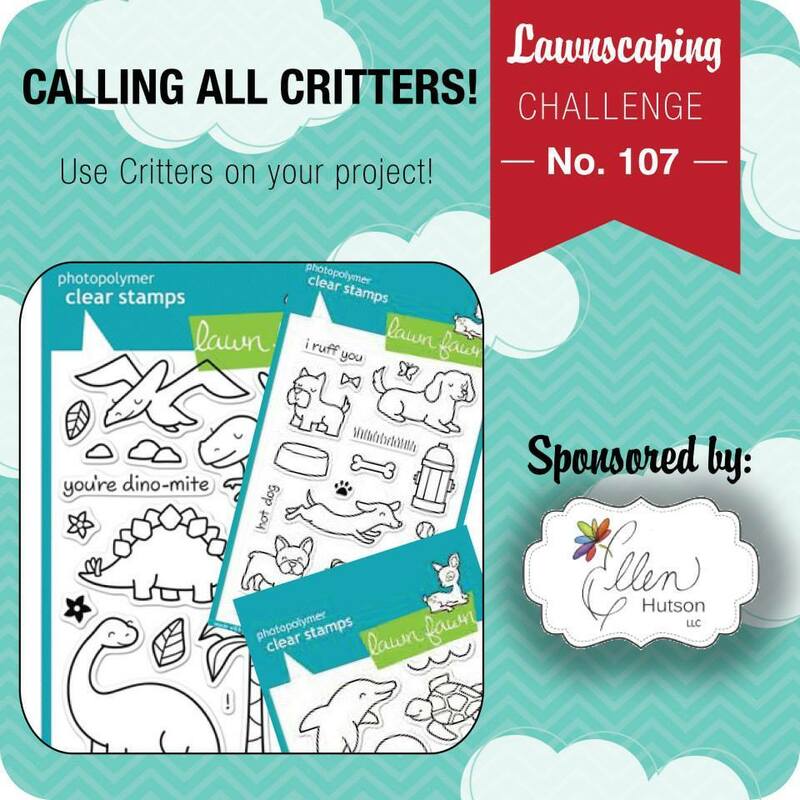 I am also entering this card in the Lawnscaping Critters challenge. Check out all of the other fabulous entries here. All your comments and blog follows are so greatly appreciated! Thanks so much for stopping by! Hello everyone! This is my second post after having my son at the end of March. 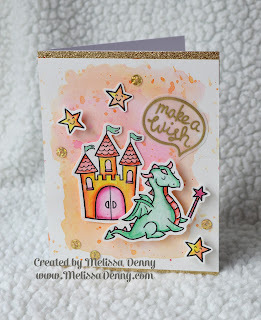 It feels so good to be back to crafting, blogging, and entering card chellenges! I'm really excited about today's post. I saw that Pretty Pink Posh was having a watercolor blog hop and I thought that this was a good chance to give watercolor cards another shot. I have tried making some in the past and I wasn't happy with the results. This time I used my Distress Inks and Distress markers (which I have been hoarding and have yet to use up until this point). I am really pleased with the results and I think I will continue to try and make watercolor cards with Distress products rather than actual watercolors in the future. You can check out the other beautiful entries here. 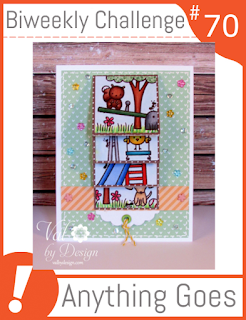 I used the distress ink pads and a paintbrush to make the background and I used the Distress Markers to color in the stamped Lawn Fawn images. I topped off the card with some gold embossing on the sentiment and some gold sequins. 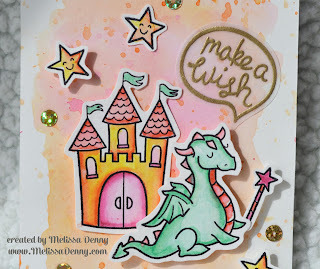 I'm also entering this card in the Marker Pop anything goes challenge, the Lawnscaping Critters challenge and the Simon Says Stamp royal challnge. A castle means royalty right? Wow! It's been so long since I have posted. I guess that's what having your first baby will do to you! Well, my son is two months old now and we are finally sort of getting in a routine. It's still difficult to find time to craft but my goal is to carve out a little time here and there because this keeps me sane and I really love to make cards. I am using this post to enter the Lawnscaping Calling all Critters challenge and also the Simon Says Stamp Monday Challenge: Royal. 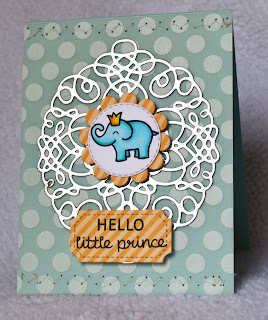 What better way to combine critters and royalty than with a prince baby elephant? 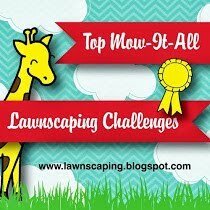 Check out the Lawnscaping challenge entries here and the Simon Says Stamp challenge entries here. I guess I had baby on the brain because my card is for a new baby boy even though I don't know anyone having a baby boy anytime soon. 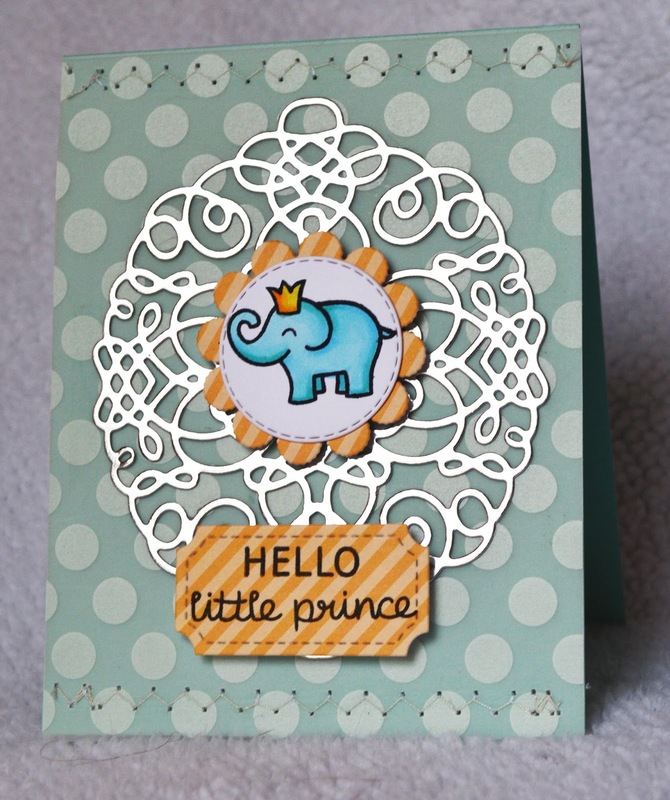 I really love the Lawn Fawn Hello Baby stamp set but instead of a frog I wanted an elephant for this card so I cut the crown from the frog and placed it on an elephant from the Love You Tons set. I used the Papertrey Ink Delicate Details die to cut a flourish shape out of silver foil cardstock. It's hard to see the foil in the picture but I think the foil adds flare and sophistication to this baby card. Plus, I'm obsessed with anything metallic these days after seeing it out there on so many other projects. I hope you enjoyed my card. Thanks so much for stopping by! Hello again! I'm back today with a project created for Papertrey Ink's Make it Monday Challenge #182. The theme of this challenge was to stamp and emboss on glass. I was so inspired by this challenge! 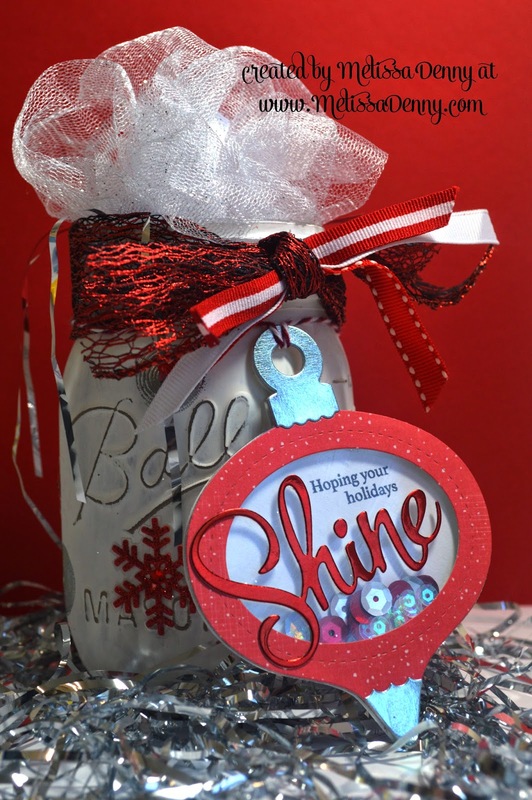 Melissa Phillips did an awesome tutorial video on this technique and created some really beautiful decorated mason jars. Check out the tutorial and other entries here! I have some new Papertrey Ink products from their September release so this was my chance to use them and get a head start on my Christmas crafting. 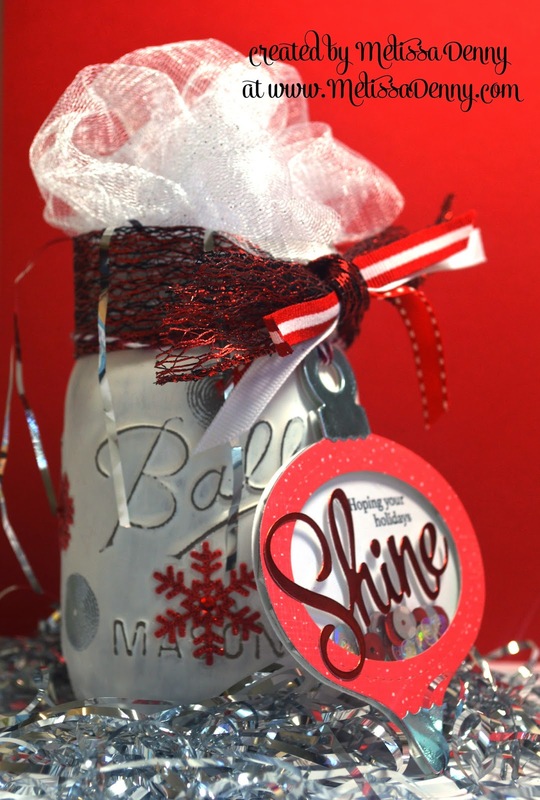 I decided to make a Christmas mason jar with a white, silver, and red color story. I used Papertrey Ink Polka Dot Basics III stamp set along with silver embossing powder to get my polka dots on the jar. 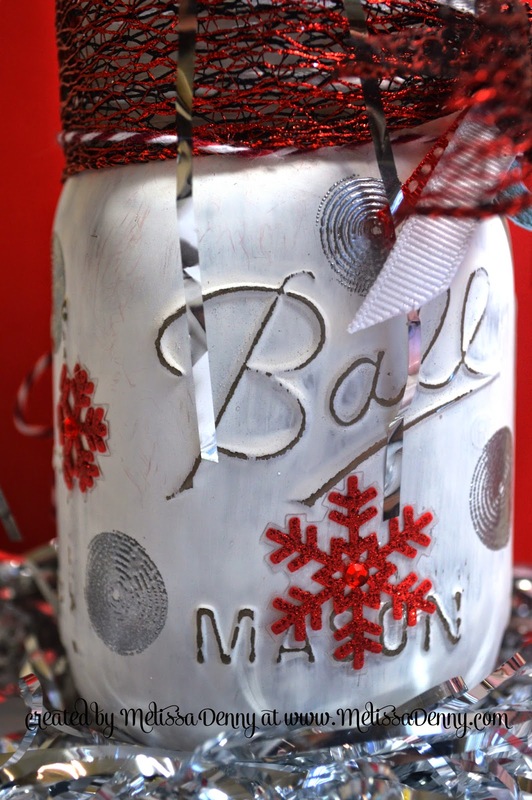 I also used some K and Co. snowflake stickers to embellish the jar. 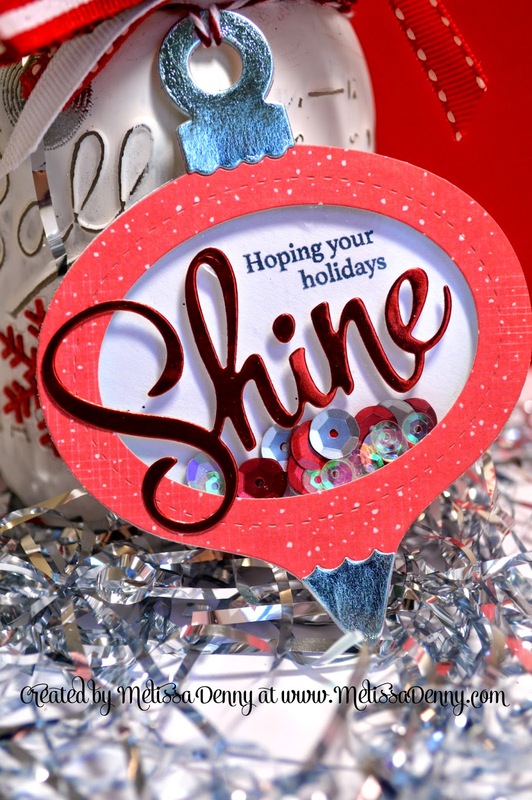 For my awesome shaker tag I used Papertrey Ink's Shaker Shapes ornament die set, Sparkle and Shine word die set, and the Holiday additions mini stamp set. I absolutley LOVE this set! I can't wait to get started on making some Christmas cards with it as well! In addition to the stamp and die sets listed above I also used Martha Stewart patterned and foil cardstock, Papertrey Ink solid cardstock, Darice sequins, and white craft paint.